Beatrice Gormley - Back to the Day Lincoln Was Shot! Beatrice signs copies of "Back to the Day Lincoln Was Shot!" 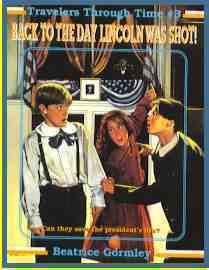 Buy "Back to the Day Lincoln Was Shot"
Back to the Day Lincoln Was Shot! That's what everyone says, but Matt and Emily's grandfather has invented a way to travel back in time. Now Matt and Emily, and their scientific genius friend, Jonathan, are about to take a trip to the night President Lincoln was shot. They arrive in Washington, D.C., in 1865, and start immediately on their mission: to prevent President Lincoln from being assassinated by John Wilkes Booth. Matt visits Mrs. Lincoln; Emily goes to Ford's Theater; and Jonathan goes to see the president himself! Can the kids convince someone to listen to them? Can they really change history? To research the facts about President Lincoln's assassination, I traveled (by car, not TASC) to Washington, D.C. Ford's Theater, where Lincoln was watching a play the night he was shot, is still there, and it's been restored to look the way it did in April, 1865. I could walk around the theater and imagine just how it would look to Emily and Matt and Jonathan in my story. I also studied maps of Washington, D.C. in 1865 to figure out where my characters would be at different points in the story. I was surprised to see how close Washington was to the borders of the Confederacy (only a few miles). No wonder the Confederate Army almost captured the capital of our country during the Civil War!